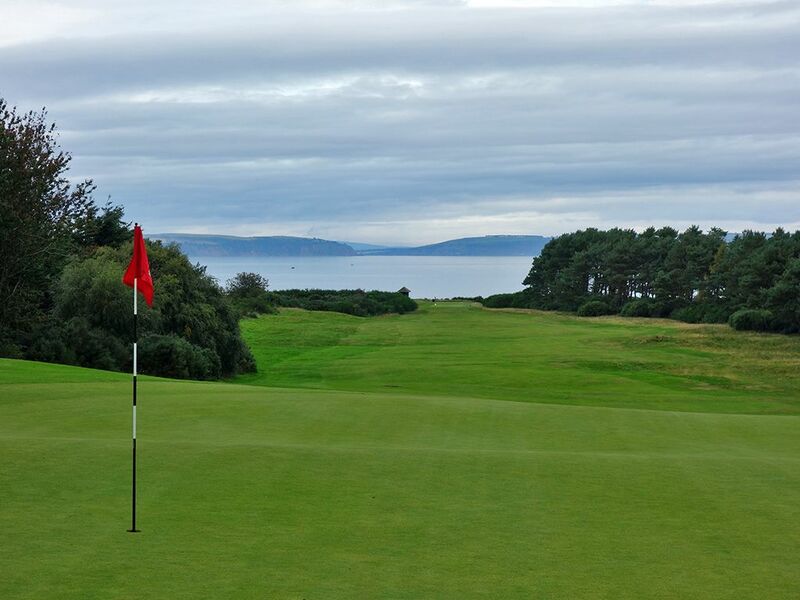 Course Website: Official Website - Visit Nairn Golf Club's official website by clicking on the link provided. 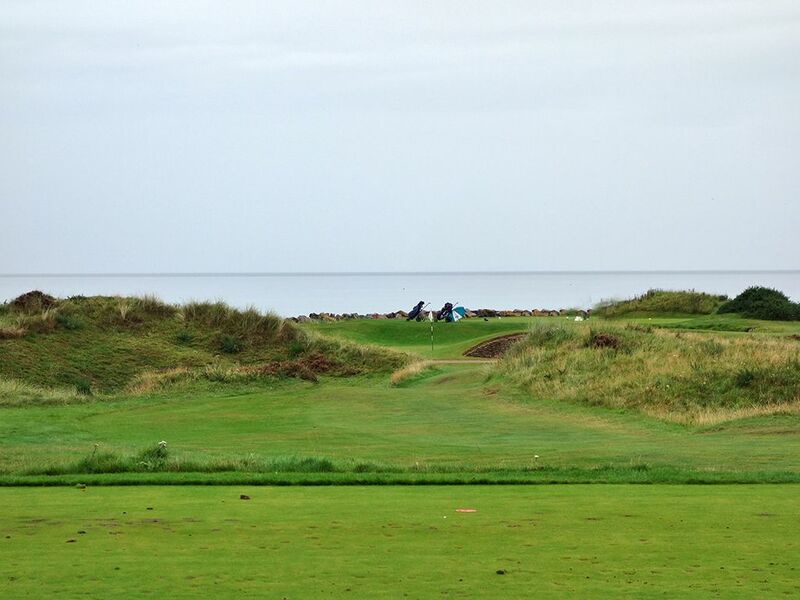 Accolades: Ranked 16th in Scotland by Golf Course Gurus. 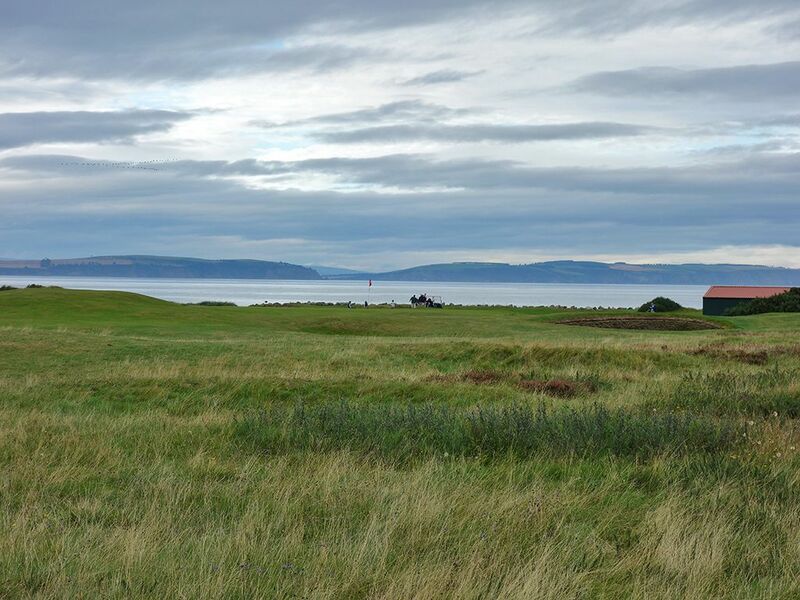 What to Expect: Nairn features a traditional seaside links layout with the outward nine working down the coastline away from the clubhouse and the back nine running parallel and slightly inland on the way back home. As a result, you are almost always playing directly downwind or into the wind. The terrain is virtually flat, with the exception of #13 and #14, which reduces some of the strategic and visual appeal of the course. 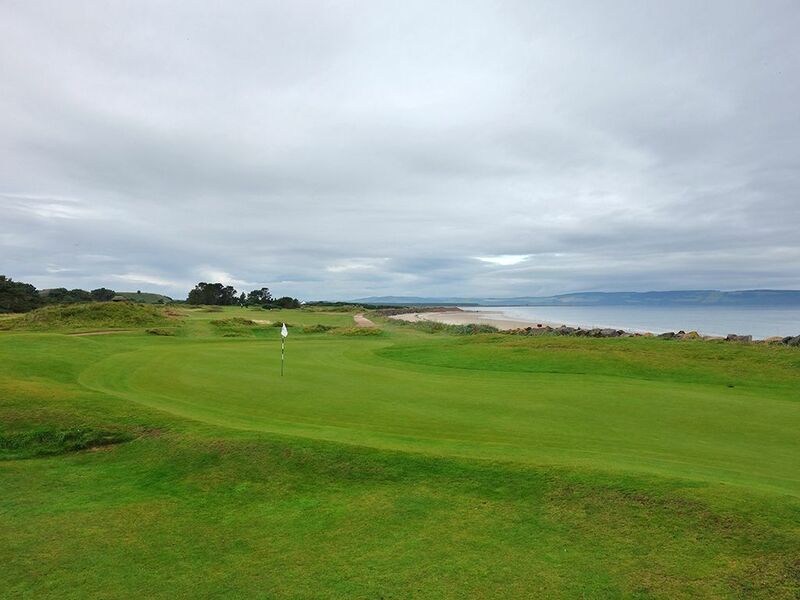 From a walking perspective you would be hard pressed to find an easier stroll on a golf course than Nairn as the routing presents greens that are close to the next tee and terrain that is easy to traverse for 16 of the 18 holes. Nairn is a quality track that isn't likely to knock you over with wow factor your first time around it but has enough subtle features to impress you more and more each loop. Perhaps the feature that people will remember the most about Nairn is that the beach right of the opening holes is not out of bounds. 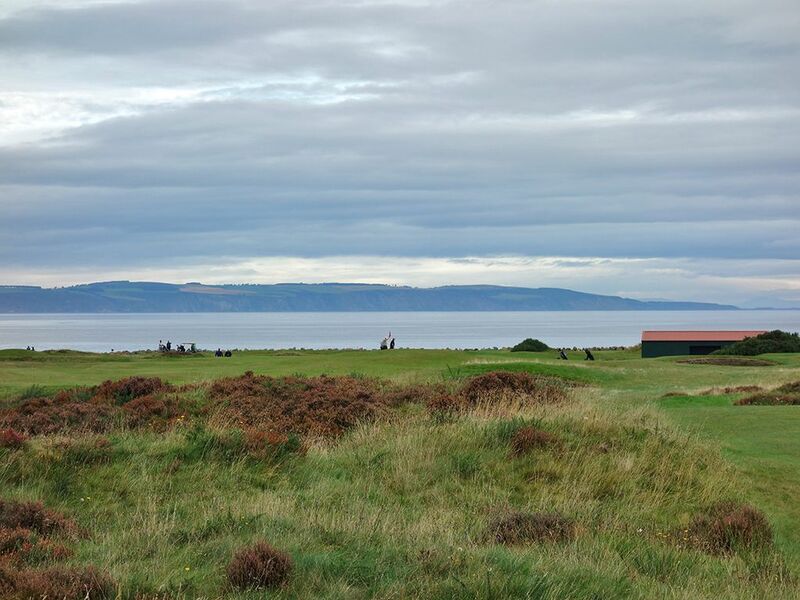 Everyday there are players that find themselves assessing their lie in the sand next to the Moray Firth's salty water trying to figure out how they are going to pull off a miraculous par save. You'll also appreciate the unique buildings at the turn comprising of a quaint farmhouse style snack shop next to a domed maintenance shed with grass growing on the roof. Nairn is a nice town with welcoming restaurants and close proximity to a couple of castles that are worth visiting when in the area. 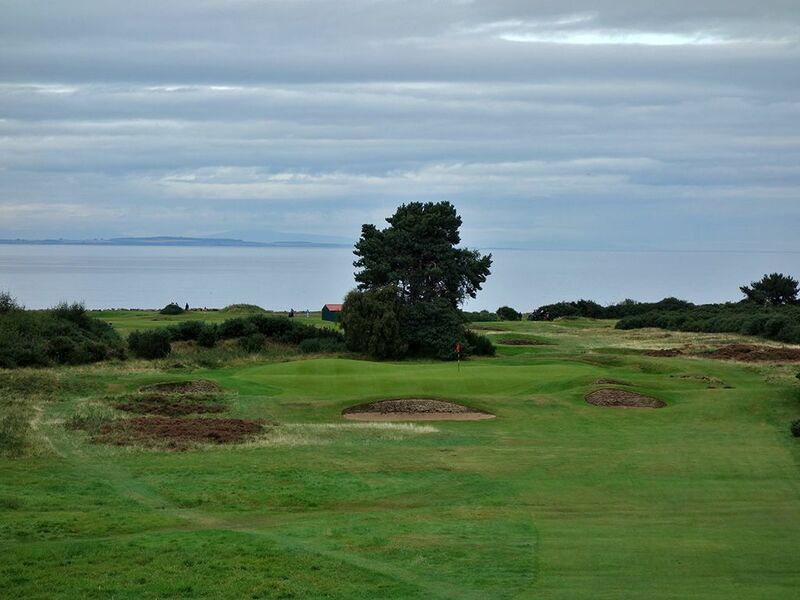 Signature Hole: 14th (Kopjes) Hole – 219 Yard Par 3 – Far and away the most memorable hole on the course, the tee shot on Nairn's final par three plays from the highest point on the course to a green fronted by four bunkers. 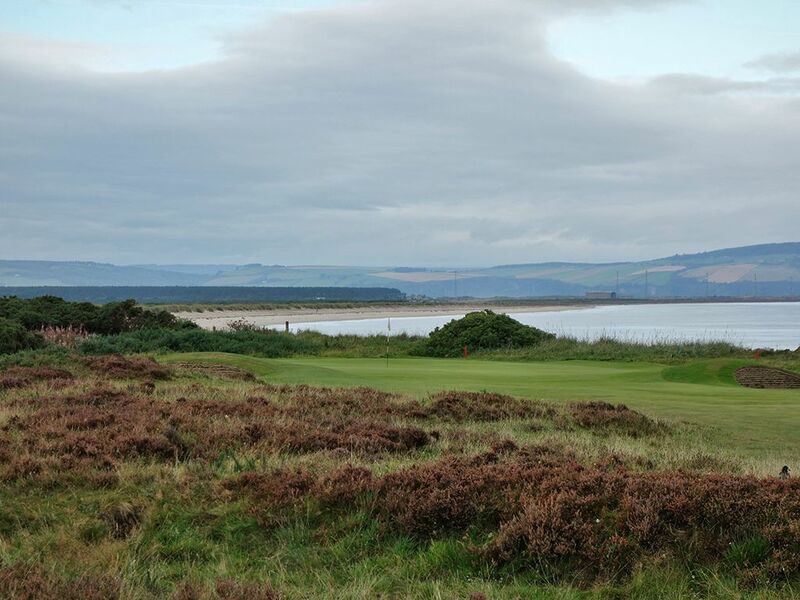 The views are simply spectacular with the Moray Firth creating the background and the Black Isle in the distance. The drop from tee to green combined with the prevailing cross wind create a difficult scenario to judge and execute properly in order to find the green in regulation, so managing a par here is a great score. 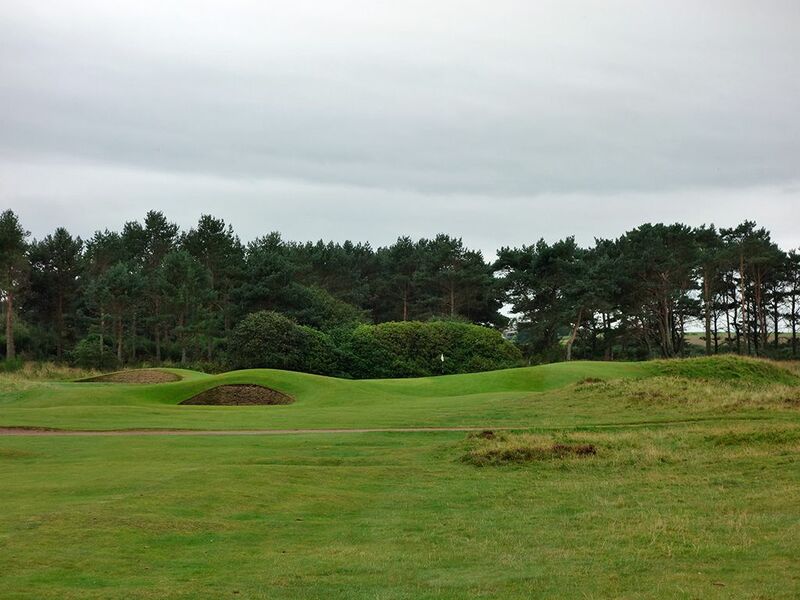 Best Par 3: 4th (Bunker) Hole – 172 Yards – Relatively short, especially when it plays downwind, this attractive one-shotter plays towards the sea and features small fescue covered dunes fronting the green. The putting surface is long and narrow with the front half protected by bunkers while the bowl effect of the green can help kick your ball towards the hole. 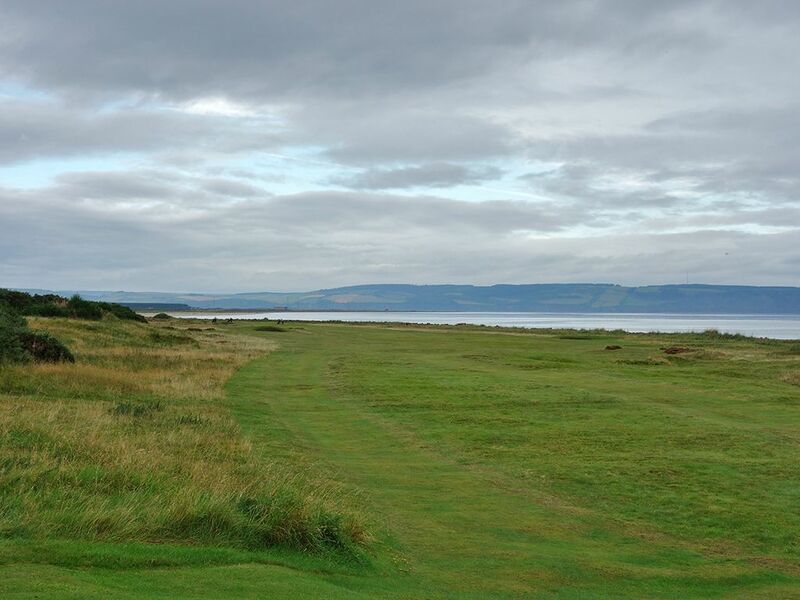 Best Par 4: 3rd (Nest) Hole – 413 Yards – Unlike Royal Troon that plays downwind with the opening holes along the sea, Nairn plays into the wind with the seaside holes that start the round and the 3rd was my favorite. The fairway initially hugs the coast before bending left and away from the sea to a beautiful raised green complex featuring mounding and four bunkers that hide much of the putting surface from view. A mound and bunker sit in front of the fairway and obstruct the golfers view of a portion of the landing area but enough can be seen to know that the smart play is to stay right of the fairway bunkers up the left side. With the green partially hidden from view, you'll need to trust your yardage since the surrounding bunkers and mounds can play with your depth perception. The prevailing wind in your face your face should help you land your approach shot softly which will be beneficial since an aerial shot will be required. Best Par 5: 7th (Long) Hole – 550 Yards – Players are greeted with 550 yards of coastal bliss as they traverse down the 7th hole appropriately named "Long" as they contend with the prevailing wind in their face. The flat terrain means that bunkering will be the main concern to deal with along with the heather that frames either side of the fairway. Bunkers sits on each side of the short grass in the driving zone with an additional bunker sitting just under 100 yards from the green waiting to gobble up layup shots. Approach shots should err on going long since the front is protected by a trio of bunkers, but going too long will find a red staked waste area. Get through this hole and look forward to the back nine that starts playing back downwind. Birdie Time: 15th (Sutors) Hole – 306 Yard Par 4 – At 306 yards and playing downwind, players should be licking their chops at the prospects or scoring well on this hole. The bumps and rolls in front of the green can be unpredictable at times but should shy players away from taking a rip at the putting surface and seeing if they can yield themselves an eagle putt. The fairway is relatively tight but if you favor the left side it should yield the greatest amount of forgiveness to work with. This is a fun hole that is begging for you to take advantage of it so go do it! 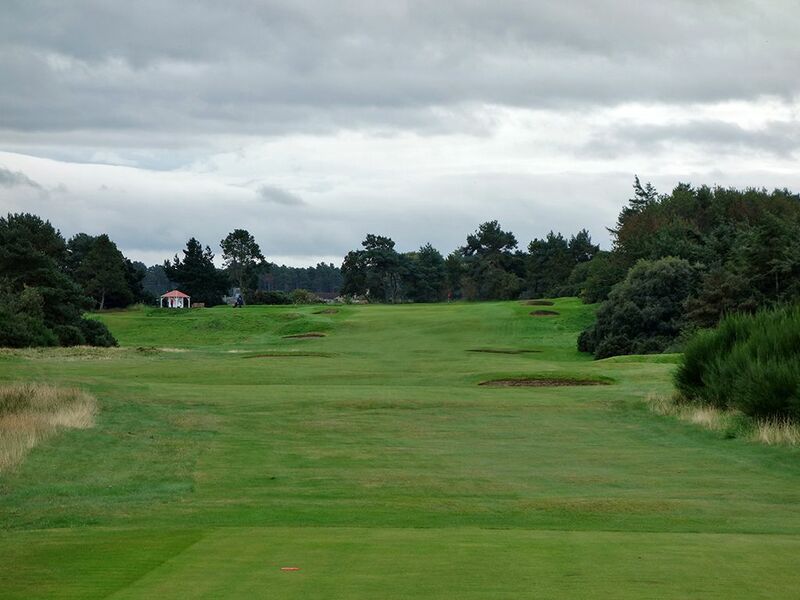 Bogey Beware: 13th (Crown) Hole – 431 Yard Par 4 – There are 16 flat holes on Nairn, one downhill par three, and one beasty uphill par four; I'll give you one guess what hole we might be featuring. Before enjoying the view from the tee box on the downhill 14th hole, you have to get there and that climb occurs on this stiff two-shotter. Unquestionably the most difficult hole on the course, the key here is minimizing the damage. Players are faced with a 35 foot climb from tee to green with three fairway bunkers and four greenside bunkers to contend with. The severe slope in front of the green repels any approach shot that doesn't have sufficient weight to reach beyond the front third of the putting surface. There are plenty of divots in the flatter part of the fairway below the green where balls have come to rest after tumbling backwards. Once you reach the green you are far from a guaranteed two-putt as the tiered surface can be challenging to judge while a putt from the back third to a hole at the front third is beyond treacherous as the possibility of rolling it back down the fairway is a very real possibility. 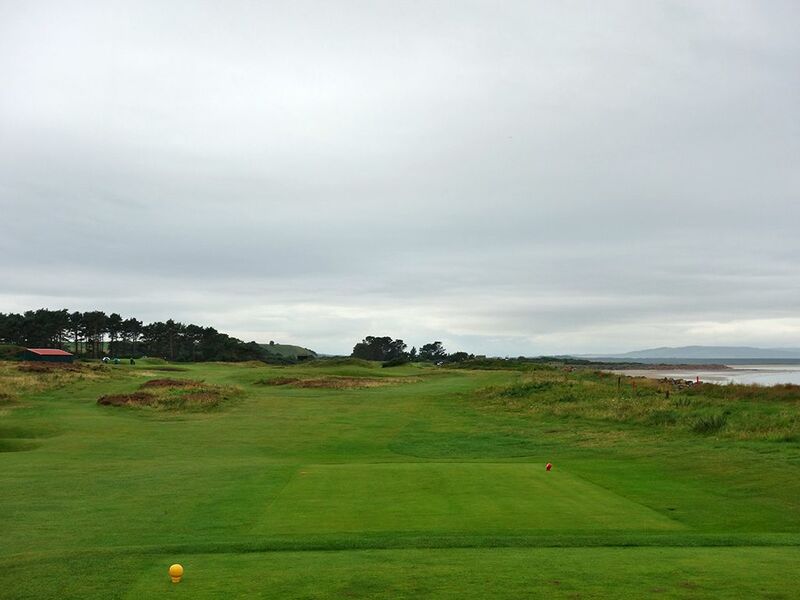 This is flat out one of the toughest pars in Scotland.